Duke’s Wood Project is an exhibition within a nature reserve which was formerly the UK’s first on-shore oil field featuring 7 new artworks by artists; Folke Koebberling & Martin Kaltwasser, Alec Finlay, Anne-Mie Melis, Stephen Turner, Institute for Boundary Interaction (I.B.I), Louise K. Wilson and Dan Robinson. It also features special events by artists Jo Dacombe and Alison Lloyd. We are delighted to introduce our new initiative Ordinary Culture and our inaugural curatorial venture Duke’s Wood Project. Ordinary Culture was set up with a view to facilitating publishing and curatorial projects that explore the ways in which art and artists connect with place; illuminating lost or forgotten histories, imagining alternatives for the future, or simply unearthing and drawing attention to things in our environment that were hitherto overlooked or unrealised. Our first offering, Duke’s Wood Project, began as a long-term research interest, looking at the history and socio-political significance of Duke’s Wood and the fascinating industrial heritage of the area. Duke’s Wood is now a nature reserve boasting a rich and thriving ecology, but once played host to a large-scale secret military operation – the drilling and excavation of our most prized yet politically contentious natural resource – crude oil. It was this unlikely coming together of two seemingly opposed things – heavy industrial and ecology – that attracted us to the site and has continued to provide a basis for detailed critical reflection. 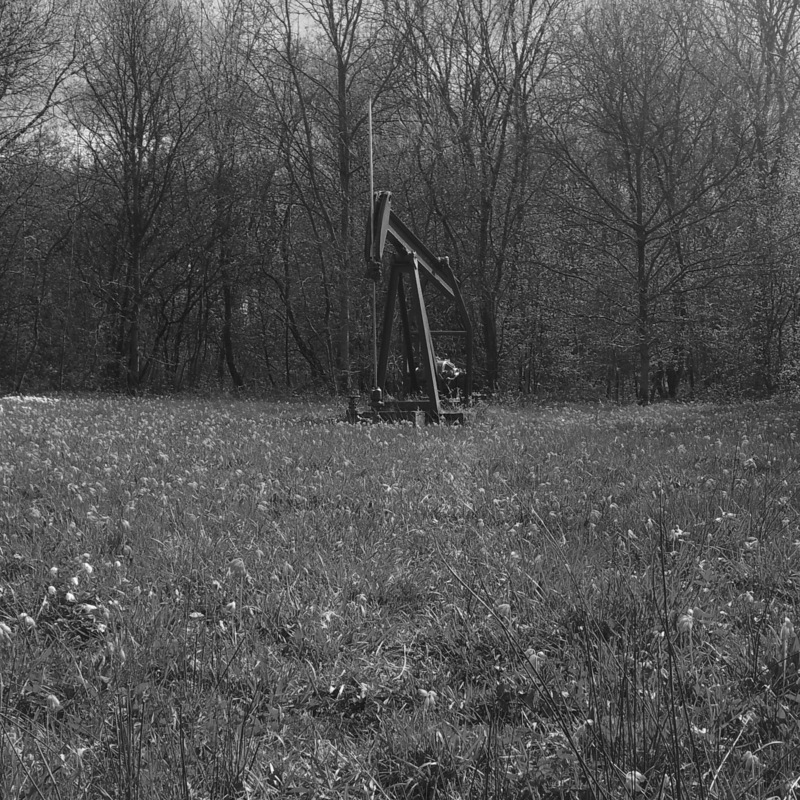 So compelling was the story of Duke’s Wood, as documented in the extensive archive within the Duke’s Wood Oil Museum, and recalled by the museums curator’s Kevin Topham and John Lukehurst, that we began to imagine ways that a contemporary art project might respond to the place and extend its fascinating narrative. We resolved that an artist residency programme, inviting 9 contemporary artists to spend time at the wood at different points throughout the year, would encourage an intimate engagement with place and enable the in-depth level of exploration required. Duke’s Wood Project is the result of over a year of such exploration and enquiry and the artworks you will find around the wood are manifestations of a sustained period of research undertaken by each of the artists involved. The exhibition programme runs from August 31 until September 29, 2013 and takes place at the Duke’s Wood Nature Reserve near the village of Eakring in Nottinghamshire. The exhibition features 7 newly commissioned artworks sited around the wood. 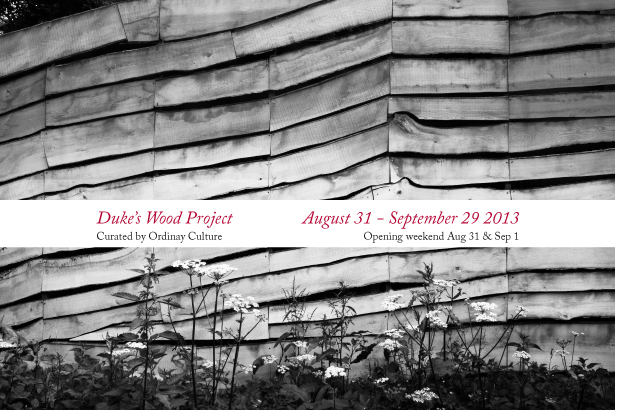 Duke’s Wood Project opens to the pubic August 31st & September 1st with a weekend of special events. Press views will be help on Friday August 30 or by appointment. Public launch of all newly commissioned artworks. Bow Down: A series of intermittent performances taking place in the woodland clearings throughout the day with poets Alec Finlay and Amy Cutler and singer Hanna Tuulikki. 5pm – 9pm – Opening reception at Duke’s Wood with film screenings and a live performance by Surfacing. Duke’s Wood Nature Reserve is open to the public at all times. Organised parties including school parties are particularly welcome. Bookings should be arranged through Ordinary Culture. Tuesday – Sunday from: 12pm until 5pm.